Western blot analysis of extracts from HeLa cells, mock transfected (-) or transfected with siRNA targeting human CD151 (+), using CD151 (E9M8T) Rabbit mAb (upper) and β-Actin (D6A8) Rabbit mAb #8457 (lower). 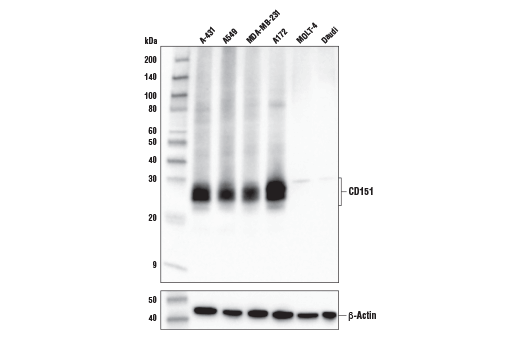 Western blot analysis of extracts from various cell lines using CD151 (E9M8T) Rabbit mAb (upper) and β-Actin (D6A8) Rabbit mAb #8457 (lower). As expected, CD151 protein is not expressed in either MOLT-4 or Daudi cells. Confocal immunofluorescent analysis of A-431 cells (left, positive) and Daudi cells (right, negative) using CD151 (E9M8T) Rabbit mAb (green) and β-Actin (8H10D10) Mouse mAb #3700 (red). Samples were mounted in ProLong® Gold Antifade Reagent with DAPI #8961 (blue). 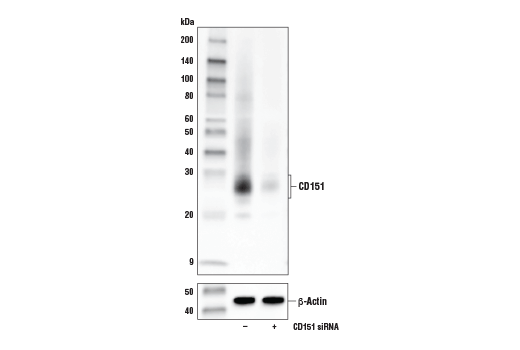 CD151 (E9M8T) Rabbit mAb recognizes endogenous levels of total CD151 protein. 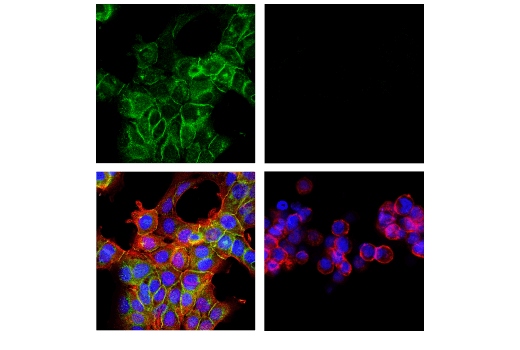 Monoclonal antibody is produced by immunizing animals with a synthetic peptide corresponding to residues surrounding Gly138 of human CD151 protein. CD151 (PETA-3, SFA-1) is a member of the evolutionarily conserved tetraspanin family of multipass glycoproteins (TM4SF), highlighted by four transmembrane domains, two extracellular loops, and N/C-termini that reside within the cytoplasm. Identified as the first member of the tetraspanin family to be implicated in tumorigenesis, research studies have demonstrated that CD151 participates in tumor neovascularization (1), tumor cell cell invasion (2), and cell adhesion (3). Furthermore, a positive correlation exists between CD151 expression levels and poor prognosis for tumors of the lung (4), kidney (5), and prostate (6). CD151 is localized predominantly to the plasma membrane and research studies have demonstrated that CD151 exerts its pro-tumorigenic effects, in part, through the modulation of laminin-binding integrins (7-9) and oncogenic receptor tyrosine kinases, such as c-Met (10,11) and EGFR (12). Takeda, Y. et al. (2007) Blood 109, 1524-32. Yauch, R.L. et al. (1998) Mol Biol Cell 9, 2751-65. Zhang, F. et al. (2011) Blood 118, 4274-84. Tokuhara, T. et al. (2001) Clin Cancer Res 7, 4109-14. Yoo, S.H. et al. (2011) Histopathology 58, 191-7. Ang, J. et al. (2004) Cancer Epidemiol Biomarkers Prev 13, 1717-21. Sincock, P.M. et al. (1999) J Cell Sci 112 ( Pt 6), 833-44. Winterwood, N.E. et al. (2006) Mol Biol Cell 17, 2707-21. Liu, L. et al. (2007) J Biol Chem 282, 31631-42. Klosek, S.K. et al. (2009) Biochem Biophys Res Commun 379, 1097-100. Franco, M. et al. (2010) J Biol Chem 285, 38756-64. Yang, X.H. et al. (2008) Cancer Res 68, 3204-13.